Helena Harper is one of those kids’ writers who provides great story books online for kids. All her books are also available for purchase from the bookshop. “Pep, Polish and Paint” is a free book for children online, available as a video here. And you can read an excerpt from the printed book here. Enjoy! 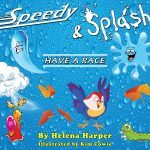 “Speedy and Splash Have a Race” is a children’s picture book that captures the imagination with a raindrop race like no other! Witness the ups and downs of both raindrops, as the race reaches its crescendo and the unexpected ending unfolds. You can read more about the book here. Enjoy!